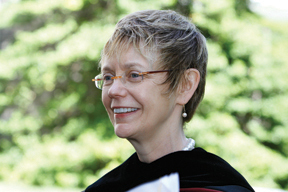 “We are global stewards and citizens whether we choose to be or not, so the question is, what kind of global stewards and citizens will we be?” says President Rebecca Chopp. 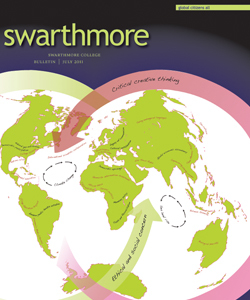 How global is Swarthmore? And what must it become in the future? “Global citizen” is a vague term and, like all such terms, a contested concept—but it points toward the reality that the modern world is interconnected. We can communicate with people all over the world in real time. The flow of capital; the exchange of goods, services, and information; and the migration patterns of many populations make us aware of these interconnections. As stewards and citizens of the world, we are also linked by environmental and political challenges that require us to work together to create a sustainable and just world. We need to understand our location within these complex new realities. I think we are already global stewards and citizens whether we choose to be or not, so the question is what kind of global stewards and citizens will we be? We have to be attentive to the needs of the entire world. What are some of the attributes of the global citizen? practice critical self-inquiry, something that I think the liberal arts is particularly good at teaching. view ourselves as citizens of the world. empathize with another person’s point of view even if that person is quite different from us. This requires that we have what Nussbaum calls “narrative imagination,” or the ability to imagine what life must be like for another person—not just how I would experience life if I walked in that person’s shoes, but how that person experiences his/her existence. What must Swarthmore teach its students to make them truly and effectively globally connected—able to interact easily and skillfully anywhere and with anyone? I think we can prepare students to learn how to interact with anyone around the world. Sometimes we try to make cross-cultural work easy or make it merely a matter of learning techniques to manage conversations. But cross-cultural interaction—especially trying to solve problems or realizing opportunities together—can be very hard work. It requires a great deal of listening, learning, asking questions, and being willing to put aside one’s prejudices and ego. Students need to have translingual and transcultural competencies. They need to become sophisticated critics and creative thinkers about various paradigms of multiculturalism and globalization and of the place of the United States in those paradigms. In what ways do you consider yourself or someone you know to be a global citizen? Are there already models for this? a willingness to collaborate across a wide range of boundaries and borders—language, culture, class, politics, religion, etc. This sense of adventure might include a willingness to sleep in a tent in the Amazon in order to conduct scientific research, to spend a summer building playgrounds in India to help underprivileged children, to work in an early childhood development center in Zimbabwe, or to organize a youth writing center in Chester, Pa.
At what level of global connectivity do you consider Swarthmore to be today? What are some of Swarthmore’s strengths? Where does it lag? As the following pages [and the foldout map] suggest, we have a good deal of global connectedness. Our alumni live around the world. Faculty members have research and teaching connections all over the world. Faculty members and staff members come from various parts of the world. Our curriculum is increasingly global in terms of particular courses that focus on history, politics, religions, and arts from around the world—and in terms of many courses now having a global perspective. Our students do some amazing civic engagement work around the world, thanks to faculty-student research and global interactions as well as to the support and direction of the Lang Center for Civic and Social Responsibility. But we need to expand our connections, we need to open our doors to more international students, faculty, and staff; we need to bring our intellectual capital to bear on problems that link our campus with places around the world. Perhaps we can discuss being a college for and of young global intellectuals who bring their intelligence and moral commitment to setting the world aright and anew. Martha Nussbaum asserts that the humanities and arts help students learn critical thinking, transcend local loyalties to become “world citizens,” and imagine sympathetically the narratives of others. As a humanist, what do you think humanities bring to being a world citizen? I will add a bit to Nussbaum’s list. One receives the incredible gifts of beauty, truth, tragedy, humor in new ways. It’s breathtaking to read the novels of V. S. Naipaul or the poetry of Claudia Lars, to play in a gamelan performance, to study the ancient art of the Noh theater, or be awed by Zulu weavings. In addition, the disciplines of the humanities teach humility, fallibility, and the limits of one’s own perspective. Understanding one’s own limits and horizons due to social location and personal history is important when one talks or acts as a global citizen. But I also think that the humanities allow one to explore similarities and differences, to build bridges even as one respects the particularities of culture and of individuals in a culture. The humanities teach us how to think about great questions of what it is to be human—what the world is, what ethics require—in sum, about the good, the true, and the beautiful, and that as human beings we answer those questions in truly different ways that constantly amaze, delight, offend, confuse, and interest us. Would you say that Swarthmore is—or should be—a global liberal arts college? Yes, to both! I think every fundamental value that we have heard affirmed so frequently in our strategic planning process opens us to realize that we are and should offer a global liberal arts education. Our academic intensity and rigor means that we can and must engage in critical creative thinking—a style of thinking that we do as well as any undergraduate program in the world. When one considers what our alumni, faculty, and students do today, our moral and civic engagement already reaches around the world. We must continue to encourage that engagement. Our Quaker values drive us to be a global liberal arts college: Respect for others must mean all others, not just those within our national boundaries; deliberative discourse must mean engaging other cultures and learning other languages; simple living should motivate us to make the world sustainable and just. The peaceful resolution of disputes is a value we now teach on a global scale in programs such as Peace and Conflict Studies and through the Lang Center. 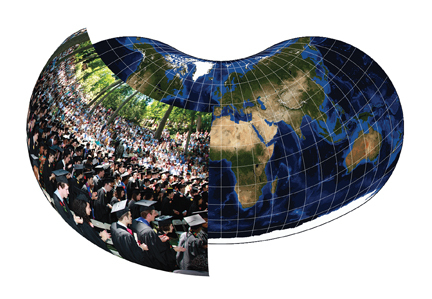 Editor’s Note: “Global Citizens All” is the third of a four-part series on the major themes emerging from the College’s strategic planning process. Data was provided by the Office of Institutional Research and the Office of the President. Special thanks to Garikai Campbell ’90, associate vice president for planning.